Since its launch in 1997, THE MOTH has presented thousands of stories told live and without notes. Moth shows are renowned for the great range of human experience they showcase. 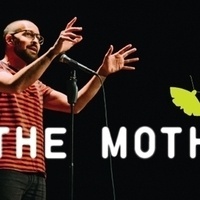 Through ongoing programs in more than 25 cities, The Moth has presented over 20,000 stories to standing-room-only crowds worldwide and it currently produces more than 500 live shows each year. Additionally, The Moth runs storytelling workshops for high school students and adults in underserved communities through their Education and Community Programs and develops innovative applications for Moth storytelling through their Corporate Program. The Moth podcast is downloaded over 44 million times a year, and each week, the Peabody Award-winning The Moth Radio Hour, produced by Jay Allison and presented by PRX, The Public Radio Exchange, is heard on over 450 radio stations worldwide. The Moth’s first book, The Moth: 50 True Stories (Hachette) was an international bestseller and its new book All These Wonders: True Stories about Facing the Unknown from The Moth (Crown) is available now.